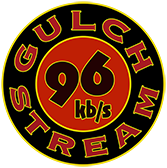 Hey Local Kids – The GULCH is happening on the FM airways at FM100.5. GulchRadio can be heard in most parts of The Verde Valley now, including Sedona, Camp Verde, Cottonwood, Clarkdale, Rimrock, all parts in between and even up to the RIM on FM100.5! The signal comes in very strong, better than we had ever hoped! If your radio is part of a stereo system, it probably came with a Dipole antenna, t-shaped pieces of flat lead that will insure a nice solid signal (stereo) inside your home, in most cases. Most likely, if you are in Jerome, Clarkdale, Cottonwood or Cornville you will be able to receive the Gulch indoors, without an antenna. 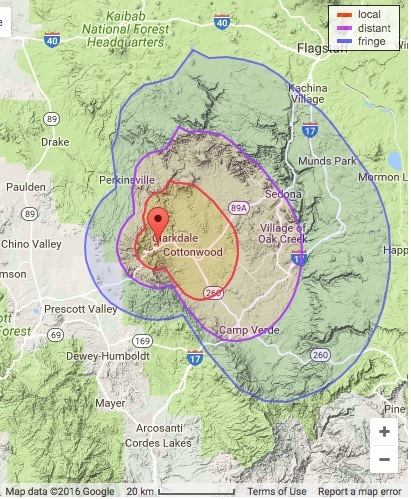 In Sedona and Camp Verde, the simple antenna described above should work well. If you are trying and can’t get it to work, go outside to your car and turn the radio to FM and then tune to 100.5 to verify if we’re receivable. If you have a problem, get contact us at GulchRadio – gulchradio@hotmail.com and we’ll help you figure it out. In some areas the signal may get stronger at sundown. If you are driving, our fabulous new FM Radio service comes in very clear all over the Verde Valley and as far away as Flagstaff – nice and clear on I-17 if you are headed north or south across the valley and to the east as far as Blue Ridge. OUTDOOR FM ANTENNAS ARE STILL AVAILABLE, Amazon and Radio Shack still sell them. If you can get us out in your car a small investment will accomplish the same in the house. I am a park ranger at the “Douglas Mansion” and we thoroughly enjoy listening to “The Gulch”. Nice variety! Please play more “Pearl Jam”! And if you get a chance to promote “Jerome Historic State Park” it would be much obliged. Hi Mark – Cool – we’re glad you are listening out there at the Park. We’ll see if we can slip some more Pearl Jamb in. We would be happy to broadcast information on any events you all are featuring. We listed you on our links page. I like The Gulch and noted your legal ID no longer includes the AM frequency, just the LPFM frequency. A couple of questions, not really important, but I’m curious. a) Did you have to relinquish the AM license when you picked up the LPFM license, or was it just a choice you had (eg, save energy)? b) When you were on AM, did you have to broadcast in stereo, which used to be a requirement for licensees in the “expanded band”? Thanks for that info. And congrats on stepping up to LPFM status. Local listeners over the air are still the bread and butter of most radio stations. Bon chance! Listening to you from Iquitos, Peru, on the Amazon River. Thanks to Ted Stratton for turning me on to you. Wow! That’s great, thanks for tuning us in. Thanks for bringing us along on your adventure. To be a little more clear…I’m an Arizonan (Tempe), but have lived here in the Amazon for many years. 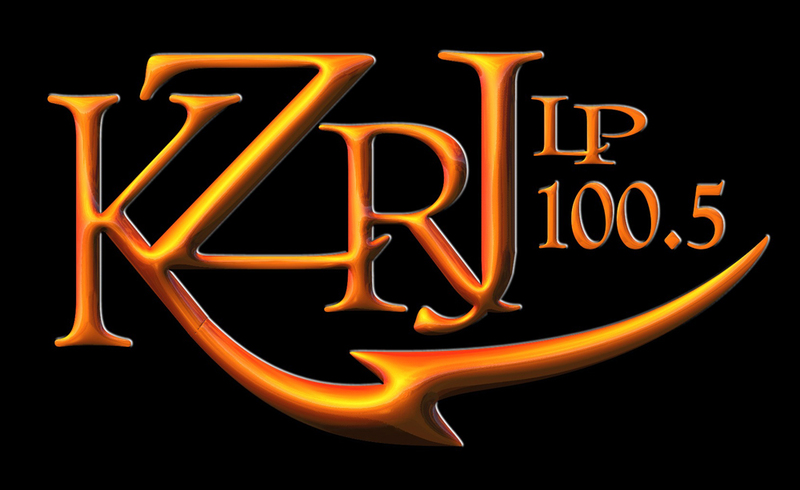 Really enjoying listening to KZRJ. We were listening on Saturday night and caught a show called Music & Morons. Loved it! Is it going to be on weekly? Music and Morons is on every other week, they will be on again tomorrow, Saturday April 18 at 6 PM MST/PDT 9 PM EDT – thanks for listening. Good morning Greece from Jerome, Arizona! Thanks for turning us on! I just found your station tonight and really liked a song I heard around 9:30 pm I Was hoping you had a now playing / recently played list so I could figure out the artist. Your station is a great discovery. Thanks! Hi James – the show you were listening to, UnderCurrents does not stream the song titles, but you can check their playlists at their site, this is the address for last nights playlist: http://www.publicbroadcasting.net/nv1/guide.guidemain?action=viewNationalPlaylist&eventID=255231&d=17&m=3&y=2015 – thanks very much for tuning us in. Had a great time listening from 5-6 with TheGeezer and now Motown! Really liking your radio station. Wake up to Rickandroll in the am…..awesome! I have been telling my friends about the station. The announcer for the Motown program sounds like he’s from Quincy, MA !?!?!?!?!?!? Is he from the Boson area? Hi Marianna – thanks for tuning us in! Yes, Motown Tom is from Boston! That accent, a dead giveaway. Music and Morons was especially delightful last Saturday! I don’t know if u take requests, but I trust you could find some NRBQ..”Ridin’ In My Car”(I do believe that’s the title. .been so long since I’ve heard my song)..and NEVER hear it on the radio. .I think your listeners would enjoy a splash of NRBQ! Thanks! I’ll pass your request onto the Morons! We’ll check out NRBQ – I’m not familiar with the band. Thanks muchly for sharin’ NRBQ. I lost my recordings of them many moves&moons ago. Thanks, much appreciated! Thanks for writing Ralph and Diana in Camp Verde and thanks for listening. We’re planning on being here for a long time and we hope you will stay tuned in and enjoying the music. you played a rendition of…..i’m ready….earlier today, 8-17. can you tell me who the artist is? thanks. Sorry this slipped by us Chuck – we play several versions of the song “I’m Ready” – I’m guessing you heard John Hammond’s. If it was a woman, it was Barbara Lewis. It’s 7:30pm..what was that song? Like..like..like. .LIKE! ***** Thanks! Sorry Laurie – I didn’t see this message until today – that was on the Hermit’s show – show 1535 -go to his hermitradio.com and check out the playlist. We love your station. Many of our friends have been told about it and they love it, too. Congratulations! It is the perfect station for the Verde Valley. We live in Sedona and your station is basically the only one we listen to. Question: How can you afford to run a station commercial free? We truly hope you can continue with that format because commercial free is “freedom” for your listeners. Keep going strong! Hi Loren – thanks for your great letter! And thanks for turning your friends onto us. We are a non-commercial radio station and we will never have commercials. How do we do it? Everyone is a volunteer to start with. We receive donations via our website using paypal, our equipment was purchased with a grant from a local patron. Donations help a lot – one we can use the money for music and fees and two – they’re good for the radio soul – as are letters like yours, they are much appreciated. So, thanks again for listening and writing. This is Rob, Dan, JK & Scott from outside of Philadelphia we came out here for 10 to do some Canyoneering and found your station 100.5 FM on the top of West Clear Creek Wilderness Area on our third day after climbing out of the Bear Canyon. We have been tuned in since. The only regret is we did not find you two days earlier. Hey Bob, Dan, JK and Scott – thanks for the note. hope you had a great hike – Clear Creek is one of our favorite canyons. Safe travels home, we’re glad you are listening and will be on the internet as well. I love your little town on the hill! What a view! Got room for one more old hippie? Hey Scott – thanks for your support. Speaking of views, check out our new tower cam from our transmitter tower. No doubt the town can handle another hippie or two. Nilson – thanks for tuning us in Minas Gerais, Betim – Jerome is a mining town as well. copper, gold and silver. Thanks for the note Kareen – we’re glad you are enjoying the tunes! We love Ray too. Best regards -and check out our live camera, click on “live cam” up above. If they ever block your stream from reaching me on the interwebs I’ll…well, I just don’t know what I’ll do. But I’ll be really, really sad. Hey Tom – thanks for the note – much appreciated. I know of no effort to block internet streaming – I’d be bummed too – I love our world wide audience. There is currently an effort to raise our streaming fees tremendously, I hope not so much that we couldn’t afford to continue. Hey Gulch! I recently bought a place in Cornville and was going through the stations and came across The Gulch! fantastic station, I gonna go out there and say, this is most likely the best radio I have heard in 30+ years! and so happy its local, great job Gulch. Sorry – didn’t see your message until just now. 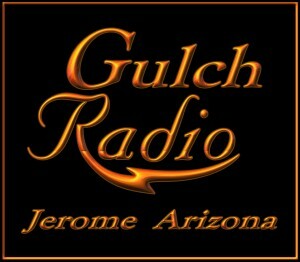 Welcome to the Verde Valley and welcome to Gulch Radio – we’re glad you found us and enjoy the tunes.Thanks for the kind words. Howdy Dave from the middle of Arizona, USA! Thanks for tuning us in! Hi Walt – thanks for the note! We’re glad you tuned us in! Great Tunes Guys, listening from Cheshire U.K. I just found you after searching for music I can actually enjoy listening to all day and night. Your variety kicks hella great! Do you ever play any Jackson Browne? The tickets are sold out for his concert in Mesa so I will have to get my JB fix elsewhere. Hey! Thanks for writing. Glad you are enjoying the tunes and listening. We play lot’s of Jackson Brown, but we don’t repeat songs on a daily basis, artists yes, songs no. Hey Mike – thanks for tuning us in. Hope all is well in Swansea. All is good Ric, you should come and visit. you would be most welcome. You only play Zappa 1 hour a week!!?? What’s up with that is once a week we play Zappa for one hour solid. Zappa gets played throughout the week pretty much everyday. 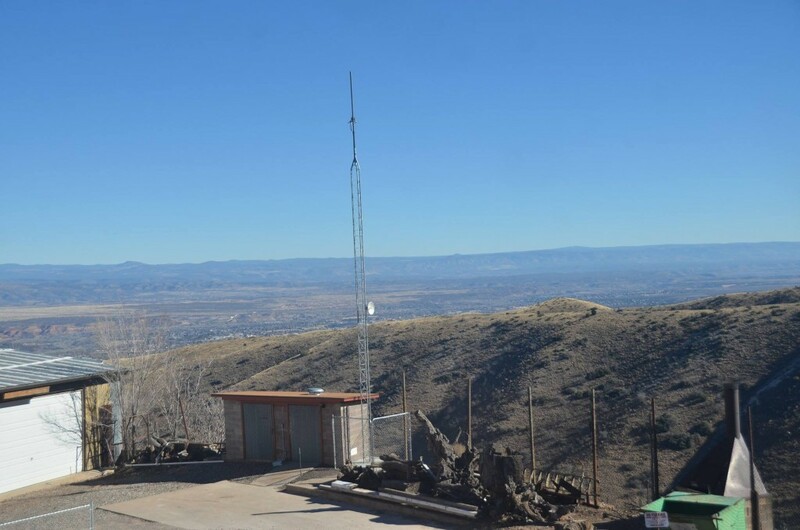 Any plans to get a signal over in prescott? It is so cool to be living in the future and listening to great tunes from my old home town. It’s really cool that you listen – and we love your photos around Croatia. They are fascinating and beautiful to me. Thanks. I am glad you appreciate the beauty here but there is just as much there. You do realize the connection between Jerome and Croatia. There were many Croatian miners there and there are many people still there with Croatian last names like Vojnic, Pecharich and Vladovich. Hi Roderick – yes, I am aware of the Croatian connection. Just talked with Rob Pecharich the other day. There was even a Croation newspaper in Jerome. Grew up in AZ with progressive radio in the 70’s but have been missing it for a long time. How refreshing to find your station on a drive to Flagstaff. I live in the ‘Dripping Springs’ area near Winkelman AZ and don’t currently have internet but now have incentive. You even blow my satellite radio away. Think you could find some old ‘Grupo Sportivo’? Hey Stephen – thanks for listening, glad you like the station, we’ll check out Grupo Sportivo, I’m not familiar with them. love listen to your music but it would be nice to know the names of some of the artist playing the music and where to find them ! very important ! hi jerome i have a request for you.when i was a younger man,i was laying my huch listening to recordings from quicksilver messanger service they had one song on there that i never heard again, it was written by Denio Valintta . he was lead guitarist he wrote the song children of the sun.i think this was a capitol record release in 1968 or 1969.could you please look into this for me thank you. will be looking for your comments. I hope you got my reply to your first post. hello jerome, is there anyway to view videos of music thats playing ? Hi Ed – we don’t stream video with the music, that’s way above our ability, so sorry, currently, no there is not. Good morning Thomas – thanks for the great letter. We’re really glad you enjoy the station to the fullest! Thanks again for writing, you made our day. Love this station and the Verde Valley. I can have a little piece of it here in Denver, CO where we also live on mountain stranded time. Hi Donna – thanks for writing and thanks for tuning us in. Us mountain folks – we’re having quite the winter aren’t we, just looked out the window and it looks like it’s starting to snow again. We can all use the water, that’s for sure. …just discovered GulchRadio and have been listening for hours online….bookmarked and hooking up to my speakers tomorrow so I can listen anywhere in my house….in Salem, Oregon…yup…. Hi Sonja – good morning. Glad you found us and enjoy the tunes. Turn it up! hope things are good up Salem way. ….I was beyond hooked when Govinda by Flo Morrisey was played last night…RIP George…..
Love love love this Station !!!!! Were from Chicago and all they have are commercials !!! So glad we can stream the Gulch once we go back !!!! Keep on rocking !! Hi Tom and Betty – thanks for the note, welcome aboard. Glad you like the music, and we’re happy to be commercial free. Safe travels. I found your station by accident while visiting from Tucson. Your music is wonderful and gives me something new (or old) to hear every day. To hear John Hartford today just made my heart glad. Good job! Big shout out to The Gulch today on KNON in Dallas on Thursday’s Texas Renegade Radio with the esteemed BP. Hi Donna – thanks for that! Hey Mr Ed – we’re looking for it – we have B.B.’s solo and play it frequently. Thanks for writing. Thank you for the Little Feat and Lowell George cuts this afternoon. Beautiful day made even better. Howdy Dariusz all the way around the world in Poland! Thanks for writing to us, we love to hear from our listeners. Glad you enjoy the music. Stay tuned, we’ve got more. Hey there Char, we’ll see if we have it. What times of day do you listen? thanks for writing. Hi Char – I checked the song out. It hasn’t been released for public consumption yet, other than on youtube. When it’s released we’ll play it. thanks for the tip. Thanks Sonja for writing. Glad we can add to your Saturday chores. Music makes the mops glide and the dusty bunnies disappear in a flash. Streaming from Belfast,Northern Ireland. You guys rock! Bom dia Roberto! Glad your listening in Sao Paulo – thanks for writing! Hey there – thanks for tuning us in. Good morning to you. Hi Lynn and Bill – sorry I missed your note. Hope your USA travels were wonderful. Glad you found us and have brought us to your home in Ontario! Thanks for writing. Listener letters are a great reward. Love internet radio…. Been listening to Ricardo while visiting Austria. Keep up all the hard work, Ricardo and the gang. Hi Kurt – thanks for the note, glad you still listen. Safe travels. Hope you and your beautiful daughter are well! good afternoon gulch radio, today is my birthday and i would like to thank you for the wonderful music your playing today !69 and having a great birthday ! keep on jamming!! Wow, listening on my phone right now. Gulch Radio is the best thing since WXPN here in Philadelphia. I kinda stopped listening to XPN because they seem to be headed for the main stream and mostly listen to Sirius XM now. Gulch is oh so much better even than Sirius!! My friend turned me on to your station and I’m so glad I found you. Hi Will – thanks for writing and thanks for listening. We sure appreciate your generous words and are glad you enjoy the station. Hi Stephen – thanks for the five stars. Hope we can continue to earn those stars. Thanks for listening! Do you still have the onion news? I enjoy it but haven’t heard it for a while? Hi Paulette – Thanks for listening. Yes we do on Saturdays but not as frequently in the past as it has been out of production for maybe five years and some of them are getting a little stale. Wish they would do new ones. Been streaming your station for about 1 year. Not sure how I stumbled upon The Gulch, I was probably searching for a streaming source for the David Gans show or undercurrents. Not much over the airways in Meadview AZ so streaming is the norm and gulch is my go to station on weekday afternoons when you play a lot of Peter Green’s Fleetwood Mac and all his solo materials, got any of the Jeremy Spencer solo stuff? Hi Gerard – thanks for listening and writing. Meadview – been there many times in my past river running days. We do play Jeremy Spencer songs, they are in the afternoon mixes. The way we mix the music they probably play sometime every week. Moro em Curitiba-Brasil e escuto todos os dias via internet, adoro essas musicas. um abraço a todos da radio. Bom dia Marlon -bom dia Brasil – thanks for writing to us. We’re glad you enjoy the music, nice to spend the day with you. hey ric–i’ve been listening to the gulch from cornville and sedona for almost 7 years almost exclusively all day long. i’ve just moved to san diego and was still enjoying the station when different updates on my computer have somehow blocked you from my external speaker. the internal speaker still picks up the station but won’t transfer to the bose. it’s such a bummer and i MISS listening to the gulch. like losing an old friend : ) i’ve tried going deep and locating settings, etc. but to no avail. any suggestions? I need to know whether you are on Windows or Mac and which OS you are using. We’ll get it to work and you’ll feel at home in sunny San Diego. Today one of your hosts (don’t know which one because I just discovered your station) played a song I loved. How can I find the name of the song and artist? The artist was a woman, powerful voice, with backup and it was a fusion of styles. That’s all I can provide. How can I find it? Hi Helga – you can search our playlist by date and hour on our home page: http://www.gulchradio.com – it’s at the bottom of the home page. Hi. You played Ian and Sylvia doing Early Morning Rain. The playlist said composer unknown. It was composed by Gordon Lightfoot in 1964. Hi Susan – thanks for the info, I just updated file, next time it plays Gordon will get his due glory. Hello, Gulch Radio! My family visited Jerome this past spring and loved it! We want to come back ASAP. Until then, we will continue to listen to the Gulch! Your choice of music is amazing! Thanks from San Antonio, Texas! Hi Jeff – hey, thanks for writing, glad you enjoy the station, we have a number of listeners in San Antoni and we welcome you. Hope you get back to the mountain town soon. Ola Roberto – thanks for the nice note! We hope all is well with you in Sao Paulo. One day I was driving along and you played such great tunes I wished I had a doobie with me…I didn’t want to get out of the car…fab!!! Hey Mindy – Great news, thanks for the letter!. We wish you had one of those things to puff on too. I am listening from Tucson on 12/05/2017 at 9:50 P.M. I discovered the station while driving through the area a year or two ago. I am able to stream it from your website and listen whenever I work on my computer. Back in the 70’s the best station around was KWFM 92.9 and the late Bob Cooke. He used to say ‘where FM means fine music’… What can I say, I was thrilled to find this format still exists. Not only that but you guys have it just right. I have added several songs to my playlist after hearing them from you. I am right there with what Mindy posted at 3:13 am (haha)on 12/3. Thats how we survived back in the 70’s along with ‘fine music’. Thank you for the station, it’s GREAT. Happy holidays Dean – thanks for the great letter. We really appreciate hearing from listeners and glad you are grooving to the tunes. Letters are a great reward for the efforts it takes to keep this all together. Roll’em up and rock on! Really digging what you folks are offering here. My first few listens, as a former public radio programmer/host, I was wondering “what is this station trying to be ?”. The answer? You’re not trying, you’re just bringing it! I love the various song interpretations (not “covers”… not with you guys). Knocking it out of the park, guys! Your station is the Forest Gump of Radio… we never know what we’re gonna get! Love it! Having a great Christmas Eve, all day with “The Gulch”. Love that you do broadcast, as well as Net. Carrying the torch. Thank you for the tunes. Best to you and I’ll be spreading the word. To all of our fans Ric is very sick in the hospital and will be so for 3 to 4 more weeks. Currently Chaz is sick as well. Communication is very difficult right now we’re doing our best to keep the radio station on the air at this time there may be some disruptions or irregular programming and we’re sorry for that but we can’t do anything it it. Here’s hoping we both get well soon. Is there anything we can do to help? (Other than prayers and lighting joss sticks) where is Ric can we send our best wishes to the hospital? Thanks for asking time is healing hopefully we will both be back soon. It will probably be several weeks before we hear from Ric but he is up and walking now. Thanks again for asking. I’ve been tuning in from Raleigh, NC. Great music! I lived in Grand Canyon for 10 years and would visit Jerome often, such a cool place. No surprise that the local radio would play such solid music. Keep up the great work! Thanks Greg for the great letter. Glad you’re listening and we hope you come back and visit. Thanks again. for several days now there is no signal. You can stream but no signal. Hi-thanks for writing. It appears someone is vandalizing our over the air transmitter. Claiming the radio waves are upsetting their brain waves. We are working on the matter. Thanks again for writing. I was wondering about that, miss you guys on the air. Thank you for your effort in offering superb quality, Frequency Modulated and perfectly safe LOW POWER local broadcast programming. My brain waves are in alignment with, and heathier from your broadcasts. Good luck with your neighbors. Hi – it appears that somebody is vandalizing our transmitter turning it on and off by switching the power at the electric meter. Sorry for the inconvenience. We are working on the matter. Hi Dr. Lance, we have had to shorten her over the air FM radio broadcast hours in an effort to resolve a claimed health issue concerning radio frequency health issues. We are working to resolve this issue and hope to be back on the air full-time soon. Thanks very much and keep the faith, will be back. Would supplying foil covered hats resolve the evil transmitter situation? Get well and get back to playing great tune-age. Missing my dose of Sunday Morning Undercurrents. Love the music you play! You sound great in the Bay Area. Spreading the word. Is the transmitter prob fixed? I miss our solid gulch music! Hope everyone is healthy again. Its been a rough month! Our transmitter issues are not resolved at this time so we are still broadcasting on a shorter schedule then we would like. Keep up the faith we hope to get this resolved soon. Hi Mike and Fiona – Time flies weather you’re having fun or not. I’m still in the hospital doing rehabilitation and probably will be for several more weeks. So I can’t say exactly when I’m going to be back but I will be back i appreciate you asking. We have been missing you Ric. I am so sorry to hear you are in the hospital. Stay strong and do what the nurses tell you! We have loved listening to the show for years now. As of 0935 3/1/20 you guys aren’t broadcasting. Please come back on the air. and get it back in the morning but out all day today . What is up ? We are in a dispute with the landlord where our transmitter site is located. He is claiming that our signal is harming his health. He started turning the transmitter on and off causing the weird hours. All the on and off has trashed our transmitter and we will be off until it is repaired. We’re very sorry for this stupid mess. We are looking into many options. staying at our current location doesn’t seem to be a possibility. We’ve been on the air from that spot for three years. the “night watchman” has been living there for about a year. Before him was a person who had been there for nearly 20 years. Plus there are cell phone complex’s just feet away. This totally lame. We are also wondering how your recuperation in going. Damn, what an ordeal you’ve been through. Very much hope to hear that you’re back in fine fettle soon. Hi Jim and Sally -I’m back to work, doing the best an old guy can! Thank you for playing In A Daydream by the Freddy Jones Band! A favorite of mine too – and right after Backstreets by Springsteen – where else can you get such variety??? Hi David – thanks for writing. I love that song, I don’t know of anyone else who plays it. Glad you caught it. Monthly recurring donation set up! Thank you for reminding me to do this – I’ve been meaning to for a long time. I love this station and Jerome! Great music, Djs and I get to keep up on the goings-on in my favorite little town! Get well soon Ric! Thank you. Thanks very much! You kids are the greatest! Just wondering if the transmission issues have been cleared up. I can stream on my computer but can’t get it in my truck…..really love your station. It’s the best in Arizona! Thanks and hope you are well and all is back up and running smoothly. Same issue as Larry on April 6th. KZRJ has disappeared in Rimrock. Seems to be the same all over the Verde Valley on up to Munds Park. I had wondered what was going on but hadn’t looked on line. What a mess! What is current status? There are no postings here more recent than April 15th. I used to listen in my car and on every radio at home then it all stopped working. Today I discovered it works in my car again but no other radios. What changed? good to hear you are on part time…we are all rooting for you !! GluchRadio is my favorite station! Thanks bunches! I have been wondering what was happening to my favorite station ever? Heartsick without you. I’m an old master electrician sound technician, semi retired and offer help with the transmitter and tower if you need it. Flip around so this and new comments are on top! Lovingly suggested! Body’s in the old TX shack? It is almost Halloweenie, ya know. hi ric it’s pat in camp Verde could you please give me an update when you have time thank you.